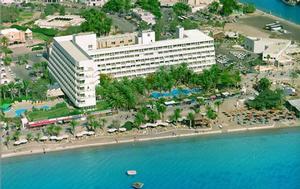 Leonardo Plaza Hotel Eilat – For the Perfect Vacation in Eilat. *The hotel features a pampering spa with a view of the Red Sea. At the spa, you'll be able to enjoy a dry sauna, outdoor jacuzzi, a range of massages, treatment rooms and a gym (at an additional fee). *Leonardo Plaza Eilat's Kids' Club offers young guests a range of activities. *The hotel features two Shabbat elevators, the option to order a mechanical key, the option to request separate beds, packaged Glatt kosher meals, an area for lighting Shabbat candles and hand washing, a synagogue, and more. The hotel rooms are spacious and pleasant, and are equipped with the highest standard furniture and appliances. Each room offers cable television, telephone, hair dryer and a safety deposit box. Most hotel rooms feature a balcony with a view of the Red Sea. The hotel offers room service 24 hours a day, as well as laundry and dry cleaning services (at an additional fee). Upgraded Rooms at the Leonardo Plaza Hotel Eilat Guests staying in the upgraded rooms are offered additional indulgences, such as: seasonal fruit basket, wine, robes, slippers, etc. In addition, guests in the upgraded rooms enjoy complimentary access to the business lounge, spa and gym, which includes a sauna and a pampering jacuzzi that overlooks the beach. 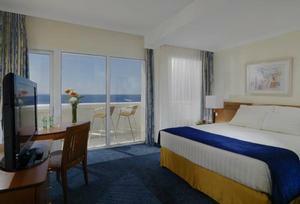 Plaza Class Deluxe – Exclusive and particularly spacious rooms, spanning some 40 square meters. Each room features a king size bed, lounge area, large television, lovely bathroom with a jacuzzi, kitchenette, coffee set, mini bar and balcony with a stunning view of the Red Sea. Junior Suite – A spacious suite that sprawls over 36 square meters, it features a king size bed, lounge area and sleeper couch that opens to a double bed, as well as a 40 square meter balcony overlooking the Red Sea. Royal Suite - A new, luxurious suite on the seventh floor, spanning 60 square meters. The suite has a spacious bedroom with a king size bed, an LCD television and a large bathroom with a jacuzzi and shower. The suite offers two additional showers and a guest bathroom. The living room features a plasma television, dining area, coffee kit, mini fridge and a spacious 40 square meter balcony overlooking the Red Sea. 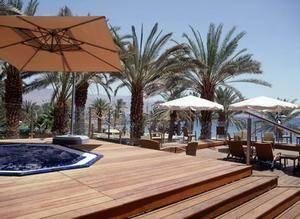 The hotel is located along Eilat's northern shore, with access to the boardwalk and a private beach.